Jerusalem was destroyed in AD 70. The signs of the end came in 1780 and 1833. The part we are focusing on here is the period between those two points, a period I am calling "The Church Under Persecution." The key expressions to look for in this section are "tribulation," "affliction," "those days," and "the times of the Gentiles." By comparing the three gospel accounts, we find that these expressions all refer to the same period. "For then shall be great tribulation... And except those days should be shortened, there should no flesh be saved: but for the elect's sake those days shall be shortened." "For in those days shall be affliction, such as was not from the beginning of the creation... And except that the Lord had shortened those days, no flesh should be saved." Luke's wording differs from that of Matthew and Mark, but in context this is the only description he gives of the period between the destruction of Jerusalem and the signs of the end. So we have to conclude that "the times of the Gentiles" is the same period as "those days" mentioned in Matthew and Mark. Notice carefully that there is no predicted period of time called "The Tribulation." Jesus is simply saying that tribulation and affliction would come to the church during those days. 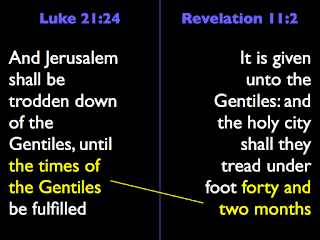 By comparing Luke 21:24 with Revelation 11:2 we learn that "the times of the Gentiles" is a particular period of time that lasts forty-two months. So, now we've compared the writings of Matthew, Mark, Luke, and John, and we've learned that the period of tribulation or affliction happens during the times of the Gentiles, which lasts 42 months. Popular Dispensationalist theory places the tribulation after the times of the Gentiles, but the Bible is clear that the tribulation of the church that Jesus was talking about was to happen during the times of the Gentiles. 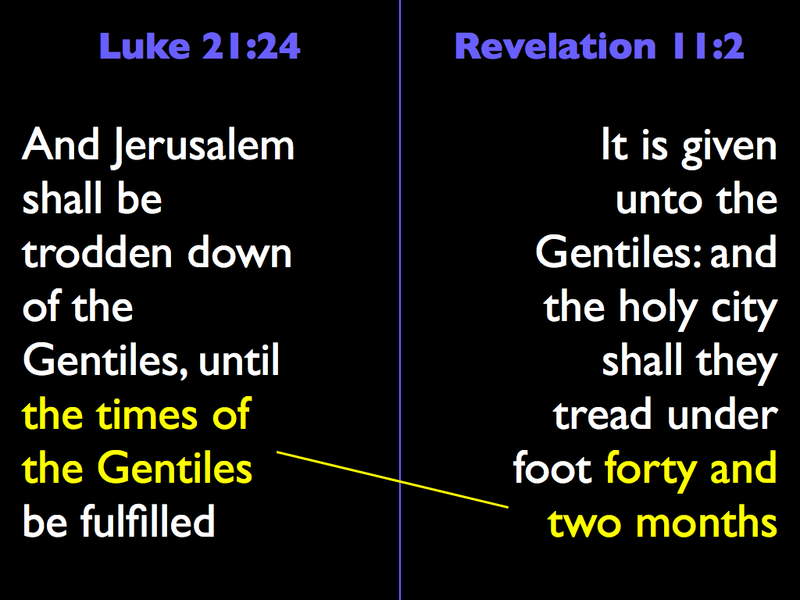 Revelation 11:2 says that for 42 months the Gentiles would tread the holy city under foot. Revelation 13:5-7 says that for 42 months the Beast would make war with the saints. So "Gentiles" in the prophecy must mean the same thing as "the Beast," whose war with the saints takes place during the same 42 months. And the "holy city" of Revelation 11:2 must equate with the "saints" of Revelation 13:7. Forty-two months of 30 days each is 1260 days. Applying the year-day principle (Num. 14:34; Eze. 4:6), we find that those days of affliction were to last for 1260 years. This period covered the major portion of church history.